TV adaptations of animated movies that aren’t watered-down are hard to come by; even rarer is the show that includes the movie’s original voice cast. How To Train Your Dragon’s Cartoon Network offshoot, DreamWorks Dragons: Defenders Of Berk (formerly Riders Of Berk) is a high-performing exception, with production values that rival the original film—HTTYD’s upcoming sequels are really going to have to ramp it up in that respect. Original leads Jay Baruchel (Hiccup) and America Ferrera (Astrid) are still on board, and while some of the adult Vikings from the movie have been replaced, they’re now voiced by all-stars like Mark Hamill and Tim Conway (!). Additionally, the show uses its character’s dragon ownership and fight for survival as allegories for adolescence and its accompanying rules, responsibilities, and danger, set against a glorious backdrop of Viking battles and dragon flights. The first season picked up where the movie left off, and explored how the winged beasts fit into Berk’s island life. It also expanded from weekly life lessons to include expanded episodes-long storylines like Alvin the Treacherous (Mark Hamill) attempting to swipe Hiccup’s dragon-training guide. 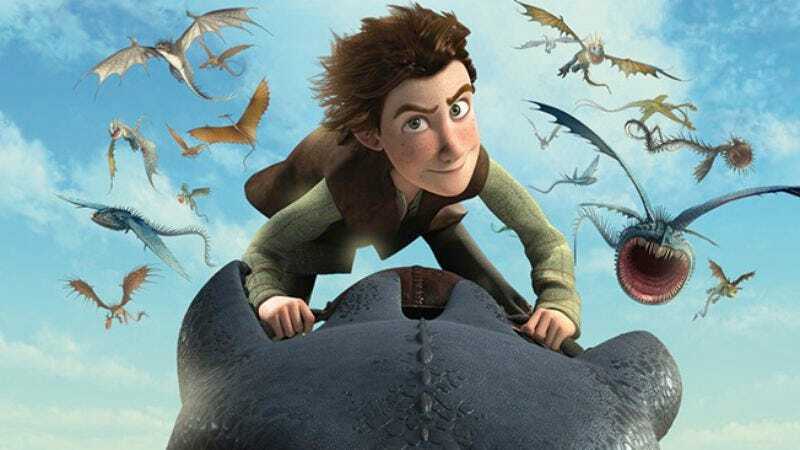 As the second season opens, Hiccup and his friends from the Berk Dragon Training Academy—brave Astrid, obnoxious Snoutlout, fighting twins Toughnut and Ruffnut, and the slow but loyal Fishlegs—have graduated from Riders to Defenders (hence the change in title) as they protect their tribe’s island. And there’s a lot to protect from—not only bad Vikings (Outcasts), but bad dragons (such as the Changewings and the ominously named Whispering Deaths) as well. Other changes: Hiccup’s father—the Viking chief played by Nolan North—remains shaken from the first-season kidnapping of his son, and thus announces a flying ban for the island of Berk. Naturally, the teens protest. One of the great things about Dragons is how the titular creatures seamlessly switched from menacing to charming—their personal characterizations (especially that of Hiccup’s Nightfury dragon, Toothless) have become some of the show’s most endearing elements. In this episode, the dragons get hilariously testy about not being able to fly, and the sulky way Toothless curls up afterward makes even a giant reptile seem cuddly. The show’s character designer, Andy Bialk, recently picked up a Creative Arts Emmy for Outstanding Individual Achievement in Animation; you can see why in Hiccup’s floppy hair, slightly stooped posture, frequent shrugs, and awkward gestures—gawkily adolescent qualities he must combat to become a great leader. These kind of visual elements peek throughout the series, as seen in the premiere’s awe-inspiring night battles featuring the acid-spewing Changewings. Such scenes offer a fine backdrop for the show’s nods to the perils of adolescence: As Hiccup’s father literally builds barricades to protect him, Hiccup knows that he will need to go out and defend the island himself: “The problem is that the safest place for me is on Toothless,” he complains. A parent can’t protect their offspring during every waking moment—an excruciating lesson to learn for Vikings and non-Vikings alike. The chief soon realizes his mistake, and in the end the teenagers are not what he protects, but protectors of the island alongside him. It will be interesting to see if this trend continues in what so far looks like a second superlative season for Dragons. Another reference for the adults in the audience (if they happened to be fans of 1970s Swedish tennis stars): The Changewings target the twins’ friend Björn Boar. Those Whispering Deaths are incredibly creepy; I actually jumped when one leapt at the screen. I dearly love how Mark Hamill just goes to town on these cartoon villains. Next week: Fishlegs gets his turn in the spotlight and one of the dragons becomes magnetic (very problematic in a town full of knives, swords, and axes).